Alligator-skin shoes: $200. Candy-painted El Camino, sitting on gold Daytona rims with a ludicrous sound system and hydraulic lifts: $75,000. Chinchilla fur coat, even though it’s California: $600. Being a local celebrity – you know where I’m taking this – priceless. I didn't buy this. I've never purchased these things. God no. This is what I saw growing up on different occasions. And the allure of it all seemed priceless, against logic, against better judgment, but priceless nonetheless. At least it was priceless to me back then before I found out that a PE ratio wasn’t how many times I played hooky versus dressing to play flag football at school. This was also prior to me coming to learn that a mutual fund wasn’t two friends throwing in $2.50 each on a value meal. According to data compiled recently by essayist and retired patent attorney Richard Everett, African Americans are projected to have spending power of approximately $1 trillion a year by 2010. That will be a significant increase over the roughly $800 billion Blacks are believed to have spent in 2006. Point is, without caring where it’s going and sometimes where it comes from, many Americans in general and black Americans in particular -- and on the whole -- tend to spend a lot. This is an anecdotally and statistically verifiable fact from the poorest end of the strata to the most affluent. I make light of this situation because I come from it. I come from neighborhoods where I and millions of other youth were reared. There seems to be a sense in the black community and it seems in the community at large that possession is nine-tenths of self-worth. An August 2007 study by Kerwin Charles, Erik Hurst and Nikolai Roussanov at the university of Chicago found that “a large body of anecdotal evidence suggests that Blacks devote a larger share of their overall expenditure to consumption items that are readily visible to outside observers than do whites. Automobiles, clothing, and jewelry are examples of these forms of "visible" consumption.” It also found that whites with the same incomes consume equal or more from a real cost perspective, although the items are less visible. I should have known better right? 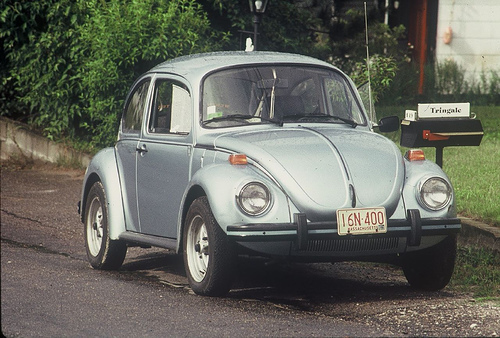 I had a great example because my mother drove an orange 72 VW Super Beatle for the better part of a decade and made me “earn” the things I wanted through incentivized programs such as “chores” and “doing well in school,” imagine that? But outside was a different story. Then as it sometimes is now, the mentality is “get it now,” “get it fast,” “got it … good” -- just get it. This was the consumer ethos of a black child growing up in the 1980s when Air Jordan shoes were, literally to die for. Author and social critic Bill Mackibben pointed out also in 2007 through his research that money buys happiness right up to about $10,000 income per capita globally on an aggregate basis. Presumably because one is happy not to be starving. Anything other than that, he asserts, is just buying things. In our country we usually buy “things” in a situation when short-term impulse diverges and falls out of cadence with long-term thinking. I’m at once loathed and relieved to admit that what I brought out of my childhood as I moved up the educational and social strata was the emotional baggage of not having. Yep, I retained the pathos rather than remembering the goal-laden, gold-starred chart on the back of my apartment door that allowed me to think methodically about what my goals were. Only through hindsight do I learn the lessons from being a kid about the chart that allowed me to arrive at the rationalization that my purchasing journey was more important than my destination, the car I drove to get to my destination and for that matter what I was wearing when I arrived. Consumption charts anyone? Why not reward yourself when you actually deserve it and have reached a savings goal? This seems like something worth doing if we must buy that which we don't really need but really enjoy. Earn it. I look at these spending patterns approaching astronomical numbers and of course there are aberrations in my community, as well as the larger American community, of people who are frugal and save. But $1 trillion in purchases right up through a recession by a group that is less than 5% of the American populous is an alarming figure for all of us, especially when there aren’t that many similar studies for fragmented groups of whites. This means that if 5% of America is collectively spending $1 trillion by next year, despite a downturn, then look for the savings rates! No really, look out for them because they are so low that we hardly know they exist. As I look at these numbers, I’m reminded that anything I can wear or sit on is not a long term asset. I’m reminded that it isn’t the mink coats and souped up cars that kill you but the small stuff: premium channels you don’t watch, accessories to clothes you don’t need, small repetitive expenditures over time like morning coffee, eating out, renting a movie, taking it home, putting it down and hitting the Cineplex anyway. As I look at these numbers, I simultaneously reminisce and peer forward as I think about credit and how it encourages immediate gratification. If you don’t have it, why buy it? And while I cringe at these numbers and think about all of the sociological, psychological and political origins of why some of my people spend this way, I am reminded that the color of money is not black or white but green and green is associated with growth. From a monetary perspective, none of us will ever grow – wealth or otherwise – through conspicuous consumption. Now if you would excuse me, I have to return this mink coat, it will be summer soon. I am fascinated by the subject of ethnic stereotypes and frugality. I grew up in an upper middle class white family, as I was continually being reminded by my father, who grew up very poor. There was a big difference in his and my attitudes towards money and consumption. He did not take money for granted, but was very flashy and status-conscious. I did take money for granted (I assumed it would just always be available to me somehow), but have always been relatively unconcerned about material posessions. It wasn't until I grew up and moved to an African-American neighborhood in a big city that I understood my father, which I found amusing; my Dad pretty much embodied the stereotype you describe, although he is white. I now live in a middle class neighborhood which is about half white and half black, the blacks having been here for decades, the whites only in the last five or six; and what I see is my black neighbors are all like the dad in Everybody Hates Chris - they can squeeze a ton of value out of every last cent. you had a very wise mother. Although the costs of all the little things you don't need add up to a lot of pain for the average household, I don't think those are the expenses that kill you. They keep you from getting ahead (by sucking up money that could have been saved), but when hard times come you can just cut them out of your spending. The expenses that killl you are the things that you can barely afford, but that you simply have to have: medical care when you're sick, a car to get to work, a safe place to live. Those things are what end up killing your finances--because any expense that you can barely afford can quickly become unaffordable if there's an unexpected expense or a little glitch in income. I'm rereading "Your Money or Your Life" by Joe Dominguez and Vicki Robins, which should be required reading in high school IMO under the instruction of a good teacher. My boss who is a talented photographer read it years ago, and noted had he applied the lessons, he'd be able to devote his energies to photography now. I would be in a different place in my life as well (this is the third time I've read it). I've incorporated many of tenants but am going to do the basic exercises this time. The first step is to figure out how much money you have earned in your working life. The second is to figure out your net worth today, evaluating all of your stuff. Do you know the difference between needs and wants? Next figure out what your real hourly wage is (adding up commute, decompress time, purchases to make you feel better because you are spending all day in a cubefarm, etc.). Then keep exact track of what you are spending. Next, figure out how much life energy (translated in the hours (life energy) that it costs you) that you expended for your purchases. Nothing is right or wrong, it is simply whether the real cost in terms of exchanging your energy for work done is worth it to you. The goal is financial independence, which can be reached when the amount of savings you have and the return on investment reaches the amount of money you require to live on. Then you have choices. Perhaps you love your current job and plan to continue to work until you drop, or maybe you want to write a book, work as a volunteer, whatever. Of course, those who benefit by having people who are not aware of their real monetary needs, which is most of Wall St., won't be in favor of such an education. If we can get to a place where we have public financing of campaigns, we can break the cycle of having "the best government money can buy." (Gore Vidal said that.) The high costs of running for office, which has paralleled the exponential growth of lobbyists in the past three decades, means that those who make the laws that govern the structure of our economy have entities other than just the people to serve. I have been thinking about conspicuous aspect of spending a bit myself lately -- not from an ethnic view but in general. Obviously, I think that such spending is unnecessary to enjoying life but the status part is what fascinates me. Spending does (or has in the past) confer status but what if status was defined by emergency funds, non-house/non-car net worth, savings accounts? Should we start pulling out our financial statements at cocktail parties? Financial Independence is the real winner IMO. The phenomenon of conspicuous consumption has been with us for centuries. Kings competed on who had the biggest castle or staff; the robber barons of early-20th-century America outdid each other in clothing and the food they ate. The key difference today is that, courtesy of credit, cheap labor, and countries willing to look the other way when knockoffs are made, almost everyone in developed countries can buy the same goods. It's easier than ever to look like your favorite celebrity or athlete. So people do it. And overdo it. ..is noticeable from behind the retailers desk. My fellow shopkeepers and I trade secrets on how to persuade different ethnic groups to buy. Some wallets open faster than others...but the slow wallets pack the most stuffing. I don't think race is the driving factor here-- you see this reckless behavior everywhere. There are people, who through their behavior, are willing to trade their futures for today. It is sad. I firmly believe that it is behavior not race, religion, or any other characteristic. That is a very interesting article. Thank you for sharing. black people spend their money on flashy cars and gator shoes is because we don't expect to live. A 401K, savings account, mutual funds, 30 year mortgage, sure, it all sounds nice. but the reality is in 5 years, i'm going to be pulled over by hostile police, i'm going to hear gun shots, i'm going to be in the wrong place and i can only hope not at the wrong time. so yeah, i'm going to flash and shine because all i have is today and tomorrow i want to be remembered. i think it's sophomoric to compare the psychological/economical state of black america to white america. Would it not make more sense though to save the money spent on "flashy cars and gator shoes" to move out of a dangerous living situation? Instead of wasting money on 'bling' and showy assets, use the money to get an apartment in a better neighborhood and stop putting yourself in a situation where you might be in the wrong place at the wrong time. The more we get, the more we want. The more we want, the less we have. I think it has to do with family. In all communities there are those who save and those who spend. I found out that one of my best friends, whom I thought was one of the richest people I knew because of all the stuff he had, was one of the poorest. What I saw at his house represented all the money he had. Nothing in the bank. All show. He continually spent all he had. Same with his whole family. We learn from those around us, no matter of race. While I agree with all of your comments, I think we must remember that there are definitely African-Americans, who are not conspicuous spenders because they are not as interested in what other people think about 'their social status'. They tend to spend their money on long-term investments including Real Estate and Education. We should look more to them to be role models. I volunteer with kids in the foster care system and I wish they had more resources and role models to validate this point of view. Too often they focus on the wrong things (yes, I've worked with kids who live in the 'hood and get subsidized lunches, yet carry Blackberries/authentic brand-name --Louis Vuitton, Gucci --gear.) They don't realize these "things" are doing little for their long-term self-esteem and ability to rise above their situations. This isn't a fresh idea about black folks and their "lavish" or conspicuous spending habits. The fact is, black America's spending habits is simply a reflection of America in general. Americans eat too much, spend too much, etc. The growing theme here is Americans = too much. True, while while black folk definitely love the pretty, shiny things, the cultural idea here is to show your best, be the best and stand out for being unique. How you achieve it by your own standards is called individuality. On the street it's called flossing. I agree with most of the comments. My goal was to look at Conspicuous Consumption first through my own lense and background then cite the data that says that a disporportinately low number of the populous spends a disporportionately large amount. On the whole, I think there is too much of a focus in America in general on materialism and consumption. For instance the recession has been blamed in part on lower consumption and after the terrorist attacks, we were encourage to shop, lest the terrorists win. There are big spenders of all shapes, sizes and colors who blow their money on bull and most of us, black white, red or magenta have made impulsive purchase. The larger culture of consumption for consumption sake is what I'm getting at. There are frugal African Americans and frugal whites, there are also black people with Lexus cars and Flat Screens living in the projects as well as those with Lexuses and Flat Screens living in gated communities in homes they can't afford. Buying gators, 20,000 diamond chains, rims that cost more than the car is no excuse for not expecting to live and this is the point I'm trying to make. Such purchases are the epitome of immediate gratification and show and tell and most of time they are made for sociological and psychological reasons that have to do with growing up poor or not getting the girl if you're not balling or yes "being remembered," or just "being somebody." Low Self-Esteem and comfort spending are a pandemic in this country across all races but that's another post. I think at the end of the day, I have to agree with Stephen and this is kind of the summation of this post: "The more we get, the more we want. The more we want, the less we have." Great insight. Too many times, African Americans get caught up in status symbols and forget the real test of wealth is what you do in the communities you live in. How do you make sure that the next generation have the tools they need to succeed? I enjoyed your perspective. I agree that spending within the African-American community is reflective of the greater American society. That on a whole we Americans do everything in excess. The recession has flashed a light on people from all walks of life who, despite having high paying jobs, have evidently lived far beyond their means. You only have to look at the rate of home repossessions impacting individuals ranging from the higher and lower ends of the economic classes. Even so, you can't help but be in awe of the astronomical spending amongst African-Americans, in light of the fact that we only make up 5% of the population. It's staggering. I definitely agree with the author that it's the small purchases which do the most financial damage. A daily Starbucks run cost an average of $25-$40 per week! When I went off of my caffeine & sugar habit, started taking my lunch to work Mon-Thurs (reserved Friday as reward day), and eating dinner at home, I was astounded to find that at the end of the month I had several hundred pounds (I now live in London) in my checking account. I swear I was afraid some bill hadn't gotten paid!! Which was not likely as ALL of my bills are set up on direct debit. The funny thing is I didn't feel as if I'd deprived myself at all. I absolutely didn't miss the expensive dinners out. And to tell the truth, my figure had begun to suffer badly from 2-3 Starbucks visit per day - yes, my weekly bill was astounding. So, the point taken is quite simple, really. The small purchases add up - tremendously! As far as I can tell we can't take any of these things with us after this life. So, time is the most important. My advice... SPEND your time in ways that make U happy. I hesitate to say "wisely" because that happens so late in life that possessions are usually narrowed down to a good pair of shoes and two different prescription glasses. But, I don't wear name brand stuff unless it's on the SALE rack at Marshall's. BUT, I do drink name brand scotch! I am a frivoulous spender when it comes to certain things as I think all people are. We choose to spend our hard earned money on things that make us feel better or at least put on a front that we are happy because of those things. We as black people have to come to the realization that there are way better things to spend our money on then flashy rides and expensive trinkets. Those items hold no value except for boosting your reputation in the "hood" or to people who truly hold no value in your life. Good article. Hopefully people pay attention to the meaningful parts. Great blog - Great insight thanks! planning for the future requires having one. i accept my situation, my way of life, i don't need a lecture. i responded to the article to clarify a point of view. you do you, boo boo.